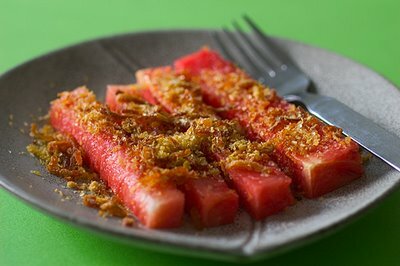 The red are pieces of chilled watermelon, and the topping an odd but delicous mixture of dried fish, sugar and deep-fried shallots. This is an old-school Thai dessert I first had at David Thompson's dinner at cy'an. He gave me the recipe, which involves taking plaa chon daed diaow, a kind of semi-dried freshwater fish, and roasting or grilling it until dry. You then pick the flesh apart and grind it up in a mortar and pestle with some sugar. For the shallots you simply thinly slice a bunch of shallots and fry them in oil until they become dark and crispy. Let them drain on several changes of paper towels, mix with the fish mixture, and sprinkle over the watermelon!